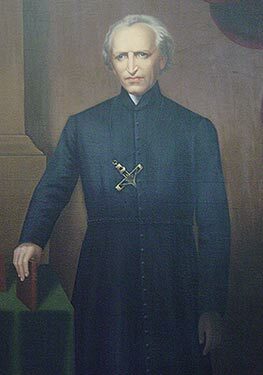 The example and the teaching of Blessed Basil Anthony Moreau continue to inspire the religious family of sisters, brothers and priests of Holy Cross, which he founded to serve the people of God. Father Moreau was born on February 11, 1799, in Laigné-en-Belin near Le Mans, France, near the close of the French Revolution. Ordained a priest at 22 years of age, he taught and served as assistant superior of the major seminary in Le Mans. 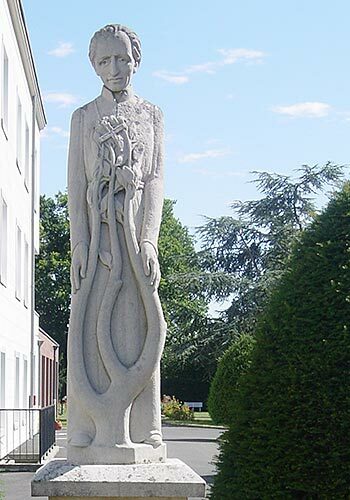 Deeply committed to preaching and Christian education in France, he laid the foundations for the society of auxiliary priests. In 1835, at the bishop’s request, he took direction of the Brothers of St. Joseph, founded in 1820 by Father Jacques Dujarié. On March 1, 1837, the auxiliary priests and the Brothers of St. Joseph were united into the Association of Holy Cross. With papal approval in May 1857, this association became the Congregation of Holy Cross. In 1841, to respond more effectively to the mission, Father Moreau founded a group of women religious. Placing them under the special patronage of Mary, the Mother of Sorrows, Father Moreau encouraged the sisters to be associated with her as women of faith and compassion, and promoted 12 virtues as a way of life. Today, the women form three distinct congregations: Marianites of Holy Cross, Sisters of Holy Cross and Sisters of the Holy Cross. Although Father Moreau resigned as superior general in 1866, he continued an active preaching and retreat ministry until his death on January 20, 1873. Today, women and men religious of Holy Cross minister in Europe, North and South America, Africa and Asia. They are engaged in a variety of ministries fulfilling their commitment to continue the mission of Jesus in the spirit of Father Moreau. With heartfelt gratitude and pride, the Holy Cross family of sisters, brothers and priests celebrated the beatification of Father Moreau on September 15, 2007.
to found the religious family of Holy Cross to continue your mission among the people of God. and an inspiration as we strive to follow you. May the Church be moved to proclaim his saintliness for the good of all people. I dare to come to you to ask that you hear my prayer. Father Moreau is convinced of God’s constant presence and activity in our world, of God’s fidelity to us. According to Father Moreau, our presence and activity are to be characterized by a passion, an inner fire, which urges us to serve God’s people in holiness. Father Moreau frequently reminds the members of the Family of Holy Cross that experiences of the cross are inevitable in life and ministry. Our response can be a means of transformation or a means of running from the cross. According to Father Moreau, fidelity is fundamental in responding to God’s call. It constitutes the appropriate response to God’s constant fidelity to us. The example of the compassionate Jesus, for Father Moreau, is the basic model and foundation for our life as ministers. Father Moreau understands community to be a powerful and prophetic force shaping our life and ministry. In founding Holy Cross, Father Moreau formed a family of three societies, men and women, lay and ordained, to be a sign of love and unity in a world of division. Today, that family comprises four congregations of Holy Cross. Father Moreau’s vision for the family of Holy Cross includes interdependence as a quality and a way of life, marking all our relationships in community and in ministry. Father Moreau regularly emphasizes the importance of remaining faithful in religious life and professional in ministry. Father Moreau planted the roots of the Family of Holy Cross deeply within the church, placing us at the service of the local and universal church. Through this placement and rootedness, we have become an international and multicultural apostolic religious family. Father Moreau insists that the members of the family of Holy Cross be open to and accepting of all cultures and countries and religious of Holy Cross. Father Moreau challenges us to be people of hope, convinced by our way of life that God is ever present and active in our world, that God has not abandoned the people. This same hope must be communicated through our ministries.